Description - Impact rolled runway flooring was designed to offer a gym flooring solution for users in need of extra shock absorption compared to regular rolled rubber gym flooring. This flooring is less dense than our standard rolled rubber gym flooring and is ideal for users who are doing plyometric work outs and other high impact exercise routines. This flooring is highly slip resistant and can be used outdoors temporarily as roll out protective flooring. These rolls are not usually recommended for areas where weight equipment and heavy exercise equipment will be used as they are not quite as durable as compared to our regular rolled gym flooring products. Even though these low cost rubber rolls are very economical, they are still backed by our industry leading 5 year warranty. Note: During certain types of running and high intensity workouts, our Impact rolls may start to break down and flake over time, creating a flooring surface that is not ideal. For these types of exercises, we recommend the use of our standard rubber rolls which are more durable and better suited for these types of exercises. Material – Recycled rubber buffings. This type of recycled rubber is the cleanest available and has the least amount of odor of any recycled rubber product available on the market. Thickness – Available in 3/8" and 1/2" thickness. Length – Available in 25 and 50 foot standard lengths. Color – Black in general but may have some minor color flecks and variations. Weight – 2.03 Lbs. per square foot for the 3/8” thick rolls and 2.91 Lbs. per square foot for the 1/2” thick Impact rubber flooring. 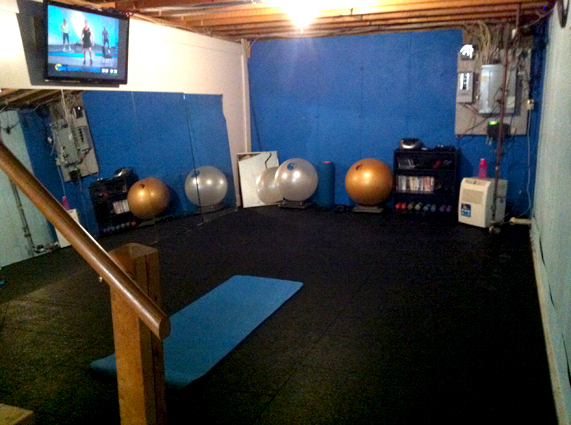 Recommended Uses – Impact rolled rubber flooring offers an excellent solution for use as plyometric training mats, and in high impact studios. This plyometric flooring solution can also be used where jumping and other high impact exercises are regularly performed and the extra shock absorption would be beneficial to helping prevent leg fatigue and/or injury. Vacuuming any loose dust, dirt, or debris from the rubber flooring surface when necessary. Occasional damp mopping of the plyometric matting with a mild soap and water mixture. Some soaps commonly used include Dawn dish detergent and/or Tide laundry detergent. This rolled rubber flooring solution is slightly porous in order to aid in the shock absorption of the rubber and this can cause the Impact flooring to take slightly more time to clean as compared to our regular rolled rubber gym flooring. Available in two popular thicknesses. May I use this product for aerobic and weight exercises? Our Impact Rolls are great for aerobic exercises due to these rolls being more shock absorbent. 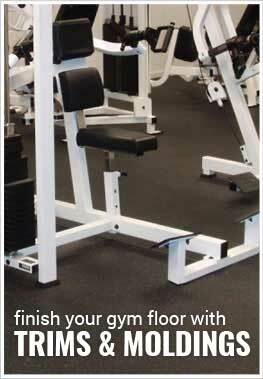 These rolls can handle light to medium weight exercises, but heavy weights are not recommended on this floor. Can you lay your Impact Rolls over carpet? Our Impact Rolls can be installed over carpet. These rolls work the best over low pile commercial grade carpet, but can be installed over higher pile carpets. The issue that you may run into when installing these rolls over plush carpet is that there may be some separation of the rolls. Another issue that may arise is that when the carpet is installed over light color carpet you may get some staining. This can be prevented with the use of a plastic sheet underneath the flooring. Do these mats have a rubber odor or any other odor? Our Impact Rolls do have a slight odor. This odor will dissipate over time and can be further mitigated by cleaning the flooring with a mild soap and water solution. I'm looking to use these mats over a light colored berber carpet and am concerned that the suggestion of putting plastic sheeting under them to prevent staining will then make the mats slip and move during workouts. Any other suggestions? The weight of our Impact Rolls over the plastic sheeting will be enough to keep the rolls from moving. The plastic sheeting will not act as a lubricant under the floor since both materials will cause a good deal of friction. We have had many people use plastic under our rubber flooring with no movement. You can use both our Impact Mats and our Impact Rolls together for your floor. Both of these products come 3/8" thick but may look different. Our Impact Rolls are typically more black but can have various colors in them. The same can be said with the Impact Mats. Other than this, the quality of the two products if virtually the same. I installed this in less than a couple of hours, literally just rolling it out and cutting with a utility knife to fit. I did not need carpet tape. The rubber flooring has enough grip and weight to stay still. We do a lot of plyo- metric workouts and even some boxing and it holds up great. Product arrived timely, as stated. It was heavy but rolled out flat. We used a $2.00 plastic carpet knife from Home Depot and replaced the blade twice - this blade was easier to use than a utility knife. I plan on installing a rubber transition in the doorways due to the high traffic in/out of the room - otherwise everything is staying in place without using glue or tape to hold it down. I installed black rubber cove base (baseboard) on the lower wall and it looks great. It does show foot prints easily but they come off ok with a damp mop - I'll be searching for a way to minimize this to keep the maintenance less intensive. 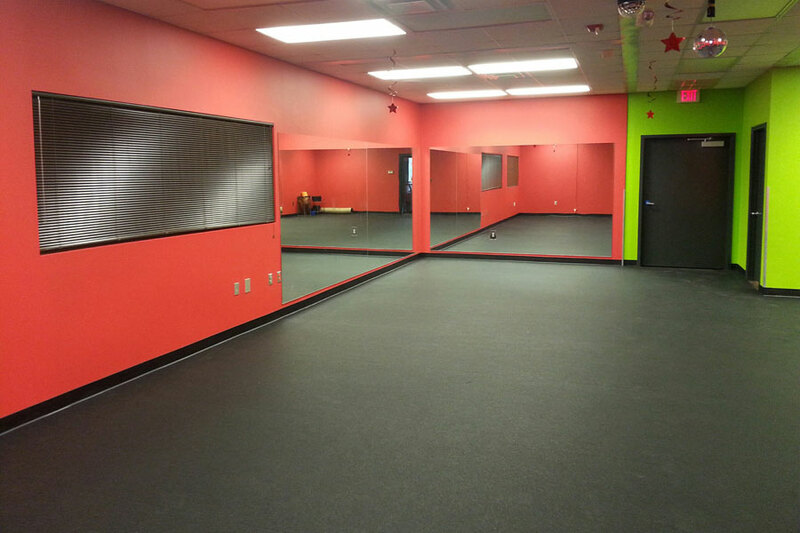 We use this room for Boot Camp, Pilates, Abs class, Step Aerobics, Zumba, Spinning, etc. (spinning bikes do not leave any marks on mat). You do need a cushioned mat when doing floor exercises. Awesome floor for my fitness room! 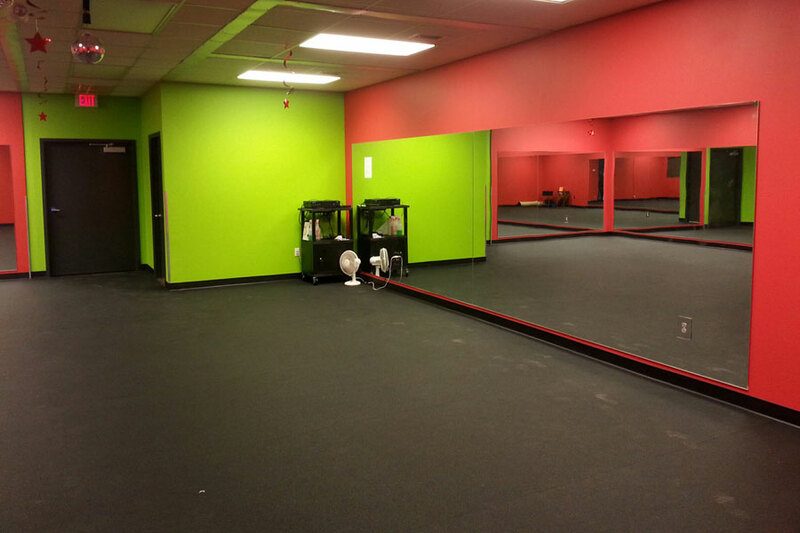 We ordered the 3/8" thick rubber flooring, and can't say enough great things about it. It has exceeded our expectations. The people from Rubber Flooring had VERY good customer service. We knew what to expect, and the delivery people were also very professional. My husband brought each of the 3 rolls down our bulkhead stairs on a 2 wheel dolly (I never could have done this) they're heavy. They where pretty easy laying out, and cutting with utility knife, and they laid nice and flat immediately. I do martial arts, yoga, cardio and step on these mats...they are durable but aren't hard like wood or cement. You can pivot on them without wrenching your knees either. We are really happy with this purchase, and it looks fantastic too. I'll send along a photo. Loving our new FLOOR ! Customer reviews are critical to my purchasing decisions, but I rarely take the time to add my feedback. 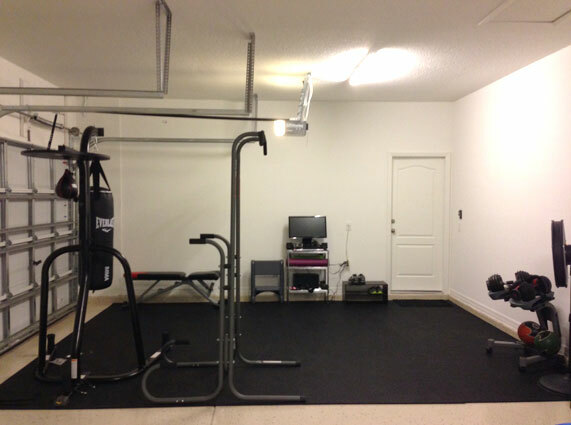 In this case, I simply must post the outstanding experience of working with Rubber Flooring, Inc. My install was for a home gym (14 ft. by 11 ft.) I Asked for and promptly received samples. Customer Service agreed to allow me to take delivery from their plant in Lancaster, PA to save on shipping. They notified me when it was ready. The install was easy -- although I would suggest 2 men because of the weight of the flooring. My wife and I have been doing p90x on the flooring which we installed directly over the concrete slab and are pleased with the quality. Don't expect this to be yoga mat soft -- it isn't. Excellent for aerobic movement. Stiff and hard enough for a treadmill and weight bench not to leave any marks. Does have a strong rubber smell at first, but this is diminishing with time. Would strongly recommend the product and the company.